POSTCARD#80: North-East Scotland: There are just so many stone circles here, it’s as if there was something mystical about this strange shoulder of land projecting into the North Sea (link). Massive volumes of stone weighing tons, how did they move them? It happened 4000 years ago, no technology, all kinds of theories. A simple answer may be that these huge chunks of granite were already scattered around in the landscape, the result of a major geological event that occurred millennia before. And the stone circles were built there, in locations where there were stones and the right kind of alignment with the moon and stars. Creating the structures would have been a major community effort, ropes and rollers and manpower. A huge task, like building the tallest building in the world, but motivated by belief and accomplished through this compelling Truth, whatever it was that’s lost to us now. In the primitive mind, the mystery was developed into some kind of myth, volcanic beginnings and culminating in these strange structures – gateway to the universe. Even so, 4000 years later there’s something I can feel here, an energy, the mystery of it… how did these stones come to be here in one place, just lying around half buried in the earth. Generations of these ancient folk looking at the moon and the heavens; experiential knowledge, wisdom not separated from the presence of the phenomenon. Everything carries meaning, words cannot describe it well enough, and it becomes a magical thing. I can picture them all standing up here, the ancient people, watching the sun and the moon and the stars. The location carries the feeling of being in the Northern Hemisphere, the top of the world – just knowing intuitively this is the North. Or maybe it’s to do with altitude… something like being at the top of a mountain looking at the view, and what you see out there has the sense of vastness. Basic common sense tells me there’s a huge drop beyond the horizon – that way is ‘down’. Then the ‘above’ – the heavens up there, over my head and all around. 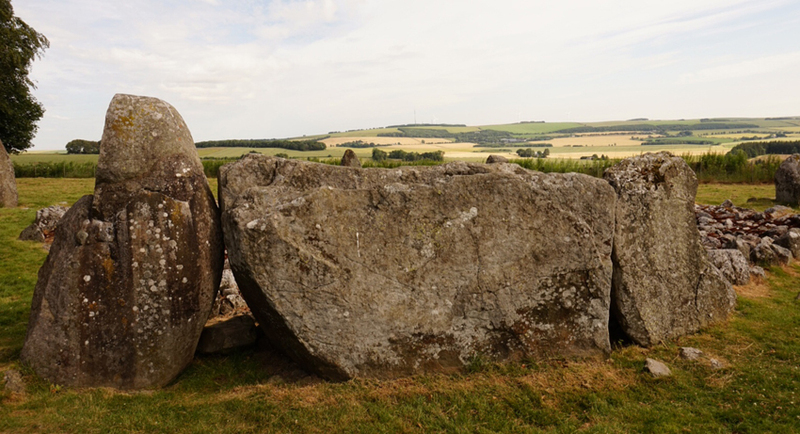 The flat stone (the recumbent) was the measuring device, or the altar, the portal, and the flanking stones on either side form a kind of frame through which they were able to view the positions of the moon. Mystical stargazing, an experiential wisdom; they were able to contemplate their location in space standing just here. Every 18.6 years the lunar standstill, where the moon appears to be motionless, caused by the coincidence of planetary orbits. You can still see marks carved on the stones where the major standstill moon rises or sets. The mystery is still here. Nobody knows. The ancients’ understanding of why it should be like this is as relevant as any scientific explanation today. The recumbent circles are pretty special… there can be no argument that the old ones knew what they were doing, even if that knowledge.. the ‘why’…is lost to us. I agree with you that their belief must have been the fuel for these monumental movements of stone. I can think of nothing else that would ensure the cooperation needed or the effort involved to build them at a time when life was much harder work than today. Yes, you can feel something in these spots that seems to erase the millennia and allow you to see through their eyes the life in the land and sky. Yes… that’s it… they would have felt that too, even if they didn’t understand it geographically… it is in the air and the light and what the wind carries somehow. It must be wonderful to feel the energy of place and stone– perhaps energy like that of the pyramids. And very intriguing to be able to ponder the moon standstill and see the marks for that phenomenon. Perplexing that certain places in the world seem to carry a special energy. And certain places in the world seem more conducive than others to various beliefs and religious practices. It’s wonderful how those ancient structures are both more harmonious with the landscape and more enduring than much which has been constructed since. Maybe the answer is not to ask but to listen. Something that was as natural as breathing 4000 years ago. Left for us to feel the energy. As natural as breathing, this is it, being receptive to the mystery. There’s no adequate explanation, no scientific analysis that’s satisfying. It’s a presence, it just ‘is’, and that’s what it was intended to be. Thanks for your observation, I see it in a different way now. Since this age, 4000 years in the past, and even before, human being have had mystic thoughts about the reality that surrounded him. And this is true not only thinking in the time dimension, but also in the space dimension: the believes structures arised around the world in many different cultures. For me, is a remarkable fact, the Universal arise of believes, in all the cultures of all the times. Thank you, yes, the universality of belief arising in the same way everywhere in the world. It’s simply the response of the people in these ancient times and their mystic thoughts about the reality surrounding them. We might see it that way too if it weren’t for the world of Science providing us with an explanation (in the context of its own terms). We really are no wiser… the mystery is still there. August 2014, current issue of National Geographic magazine has an article entitled, “The First Stonehenge, Scotland’s Master Builders” with wonderful pictures– one of the Ring of Brodgar on the Ness. They talk about the Orkneys as being the key to Neolithic religion and several buildings designed to highlight the equinoxes and capture the light of the winter solstice. Sounds and looks fantastic! Oh to be on the top of the world. But I found a strong spiritual energy in, and affinity for, the tropics– Jamaica in particular. There is definitely a spirituality of “place” but why is a mystery. Perhaps it has something to do with islands. However, living on the isle of Manhattan in New York City I find myself hard-pressed to feel spirituality of place here. Dear Tiramit, Oh, please don’t give it a thought. I am sorry I have not been commenting on recent posts. I am enjoying them but still struggling with things I have written about recently. Additionally my husband had a psychiatric client who committed suicide. A high profile case in the national news. Tom can’t even grieve his loss because his agency is so concerned about bad publicity, Tom fears for his job. This was one of Tom’s favorite clients. So it’s tough right now. Where exactly in Scotland is this? I’d love to go there!